Three separate fungal organisms are involved in this disease which can infect most varieties of eastern red cedar (Juniperus virginiana), juniper, apple, crabapple, hawthorn, quince, mountain ash, pear and serviceberry. 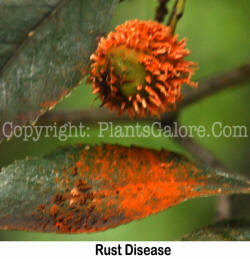 The symptoms on the deciduous hosts begin with yellow spots on the upper surface of the leaf. In late summer, brownish clusters of threads or cylindrical tubes appear beneath the yellow leaf spots or on fruit and twigs. The spores formed in the threads or tubes infect the leaves and twigs of junipers during wet, warm weather in late summer and early fall. Galls and swellings on the junipers appear about seven months later and form gelatinous masses of spores after about 18 months. The rust diseases are very conspicuous on red cedar and junipers during spring when the galls are covered with orange-brown, gelatinous masses. Rust spores formed on the masses cannot infect other junipers. They infect the twigs, fruit or leaves of the deciduous host during wet, rainy weather in early spring. If practical, destroy nearby junipers or prune off galls in late fall or early spring before crabapples are in bloom. Avoid planting susceptible deciduous hosts near red cedars. Plant resistant varieties of hawthorns such as the Washington hawthorn, Crataegus phaenopyrum. Fungicides applied as soon as the foliage opens on the deciduous host will minimize this infection. Timing is all important since the spores will be on the leaves as soon as they open. A plant that is resistant to a disease is NOT immune to it. A resistant plant is still susceptible but is much less likely to contract a particular disease or may not suffer as much damage from it if it does become infected.